Here’s a little more insight into the group that President Obama is pressuring Israel to make one-sided concessions to. Palestinian Media Watch has criticized the Palestinian Authority and its ruling Fatah party, for inciting violence by using it “Main Page” on Facebook to glorify terrorists. Now the “moderate” terrorist group of President Abbas has defended its glorification, bashing PMW saying glorify terrorists because the killers are their role models. 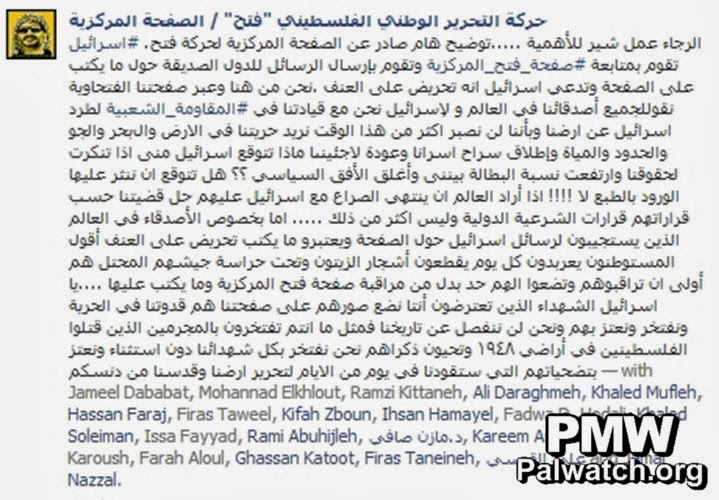 Israel (i.e., Palestinian Media Watch) has been monitoring Fatah’s main [Facebook] page and sending messages to friendly nations regarding what is written on the page. Israel claims this is incitement to violence. Through our Fatah page, we tell Israel and all our friends around the world, that we are on our leadership’s side in the popular resistance to drive Israel off our land and that we will no longer show restraint. We want our freedom on the land, at sea and in the air, [we want] the borders and the water, the release of our prisoners and the return of our refugees. What does Israel expect from us if it denies our rights, if unemployment increases among us and if the political horizon is gone?? Does it [Israel] expect us to send flowers? Of course not!!! If the world wants the conflict with Israel to end, it must solve our problem as called for in its resolutions, in decisions of international institutions, and nothing else. These are not the words of a group looking to make peace.